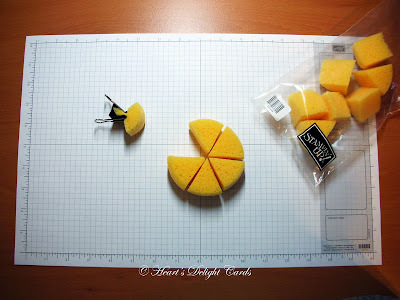 Today's post was inspired by a discussion over on Stampin' Addicts about whether or not one can wash their stamping sponges. Yes, you can! They will still be somewhat stained, but they won't transfer the color. There are several different ways to do it. Amy, one of the SA moderators, throws hers into a lingerie bag in the washing machine, along with some towels. I'm too chicken - I just wash mine by hand in the kitchen sink with Dawn detergent. Another idea came from Anne Matasci's upline, who washes hers in her dishwasher's silverware basket with the little lid down to keep 'em from getting out. In these lean financial times, I'm trying to be as cheap thrifty as possible, while still submitting to my addiction, lol. A pack of three Stamping Sponges (#101610) is only $3.50. I cut mine in half and then each half into thirds, so I end up with 18 pieces from one pack of sponges. It helps to use a medium binder clip as a "handle" to keep the ink off your fingers! Of course, for me it's a lost cause - I'm gonna end up inky no matter what I do! I hope you are having a wonderful Sunday! I'm off to my upline's all-day stampin' Christmas Blitz. Trying to get my cards finished today!!! Great info post Cindy! Love the pics that you added. Very helpful! Cindy I thought I was the only one who used the clips on my sponges. Does it keep the ink off my fingers? NOPE! LOL... but it makes them easier to handle. 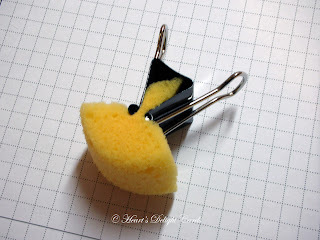 I love the idea of using binder clips. I keep my sponges inked. When I use one for a color I write the ink name on the sponge with permanent marker and then keep them in those plastic divider boxes. I do a lot of sponging.